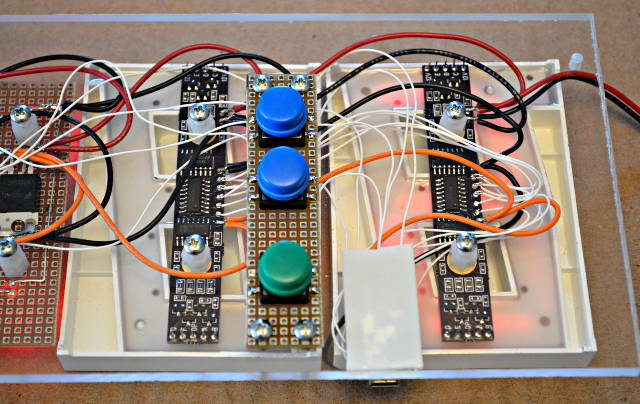 Click "Read more" for photos, source code, schematic and other info. The green buttons starts & stops the countdown. The 2 blue buttons add or substract 1 minute. It's a very simple and minimal user interface! Here's a rough schematic for the whole project. Well, except I left off the 7805 regulator and maybe some other mundane stuff, but this is pretty close. The main challenge was driving the LEDs with a constant current, because they need about 10.5 volts across the several series LEDs. I wanted to run from 12 volts, so there wasn't much voltage left over for the normal current limiting resistors. Instead, I used this opamp circuit. The 7 segment displays were something I'd purchased from an E-bay merchant about a year ago. I can't find then anymore, which is sad because they were really cheap. I actually created this PCB only days after the last Dorkbot open mic. Here's a photo of the board. I'll attach the PCB gerber files. I also have 2 extra boards left over, which I'll toss in the Dorkbot free parts pool. If anyone grabs them for a real project, hopefully this info will help. [dorkbotpdx-announce] Reminder: DorkbotPDX 0x0B is tomorrow! [dorkbotpdx-announce] DorkbotPDX 0x0A is Monday, 8pm, at Backspace!